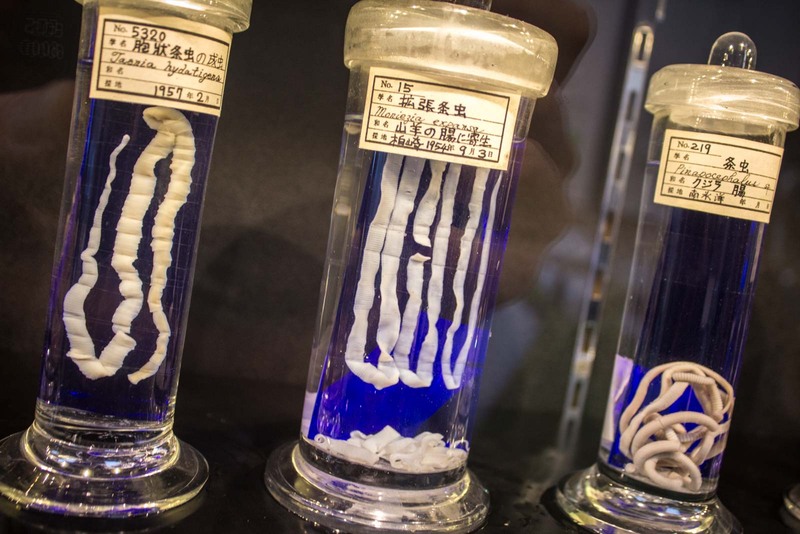 Why would anyone want to go and look at tapeworms? It’s the question I’m asking myself as I walk up to the entrance of this museum in Tokyo. It’s not any old museum – no history, artwork, demonstrations, cultural artefacts. 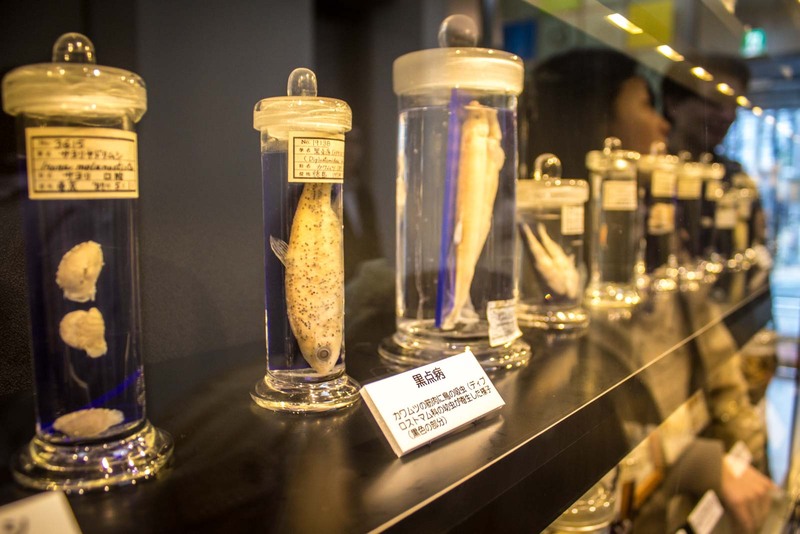 This is a museum of parasites: the Meguro Parasitological Museum, to be exact. As I walk in, I again ask myself the question – why would anyone want to go and look at the tapeworms? Because the museum is packed and I have to squeeze my way inside. Now, to put things in perspective, this is not a very big place. There are two levels but neither would be much larger than a double garage. But still – there are dozens of Japanese people here acting as though it’s perfectly normal to spend their Saturday afternoon surrounded by jars of dead parasites! It proudly declares itself to be the world’s first parasitological museum… but I’m not really sure if that’s much of a boast. It’s kind of like bragging you’re the world’s first rabies theme park – of course you are because nobody else would come up with it! But a Japanese man named Satoru Kamegai did come up with the idea for this museum in 1953 and it’s been going ever since. It’s part of a bigger research organisation that has many more specimens than are on display (more than 45,000 in total!). The current building has been used for the exhibitions since 1993. There are scores of jars that glow an eerie blue and inside are all sorts of weird looking things you’re glad are not inside you. Worms, crabs, bugs, and things with forms I don’t recognise. Once upon a time they were all living off someone like us. Most of them look so small and non-threatening so it’s scary to read about the effects these things can have on humans. It’s also quite scary to read about how some of them have no effect on humans… they just live inside and go about their business. That’s pretty creepy too, if you ask me. 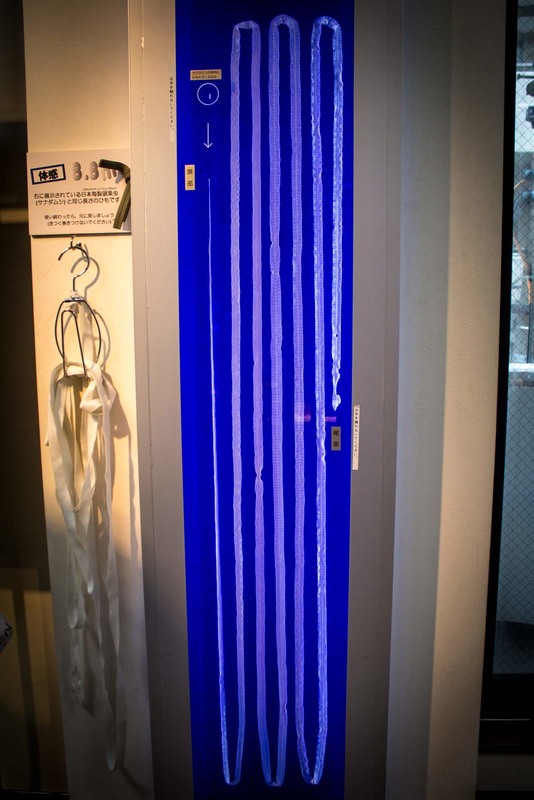 The centrepiece of the Meguro Parasitological Museum is the tapeworm that measures 8.8 metres in length. It is proudly displayed in a special frame on the wall… although it’s slightly disappointing to see it wound around rather than in a straight line. I’m not sure the room would even be long enough for it to be displayed out straight. Luckily there’s a handy 8.8 metre-long bit of ribbon you can play with to get a sense of how big the tapeworm is. The people here seem fascinated. Little exclamations of shock or revulsion escape their lips. There are families, young couples, groups of friends. Perhaps they’re from out of town and thought this would be an odd Tokyo experience, perhaps they live here and have never been before, perhaps they’re just big fans of parasites. Personally, I wouldn’t say it is really worth the trip. Most of the information is in Japanese only, which makes it difficult. But even so, it’s a relatively small collection that doesn’t take long to see. And anyway, do you really want to remind yourself that these things exist and are constantly trying to find their way inside you? WANT TO KNOW MORE ABOUT TOKYO? 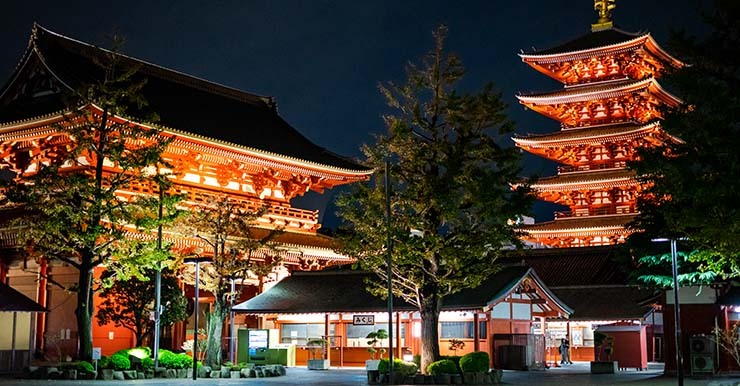 You may also want to consider taking a tour in Japan, rather than organising everything on your own. It’s also a nice way to have company if you are travelling solo. I am a ‘Wanderer’ with G Adventures and they have great tours in Japan. Wowzahs! I wonder how long it took the person too realize they had an 8.8 m long tape worm inside of them! Trippy! Check out the Hunterian Museum next time you’re in London, it’s chill inspiring too. I love parasites! they are so interesting. I’m pretty sure they took the tapeworm out of a human. At least, that’s what I think I read (there was nothing in English about it at the museum). Apparently it’s the longest in the world! holy cow this is scary! and some of the worms are huge! i remember the show on TV, “Monsters Inside Me” where they usually caught parasites on their travels. Please don’t say that! Getting some weird tropical disease or parasite is one of my biggest fears when travelling!